Wear the elegance of the forest when you shop our selection of elven and nature inspired earrings. We offer a wide range of forest-themed earrings, including gorgeous mixed metal leaf earrings and art nouveau flower earrings that will give both fantasy and everyday outfits an extra touch of earthy beauty. 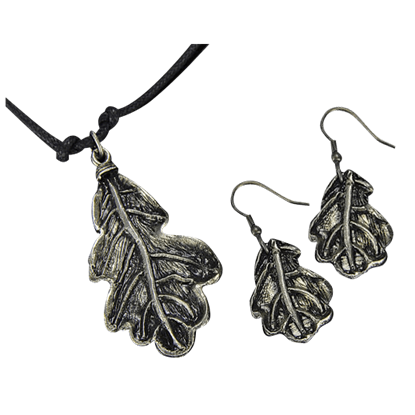 Check out oak leaf earrings, flower vine drop earrings, and even green man themed earrings here. Our earrings are made of a variety of high quality materials, including sterling silver and white bronze, and we offer elvish inspired earrings in many different styles, including French hook nature earrings and flower stud earrings. The changing hues of leaves serve as one of the loveliest markers of the arrival of autumn. 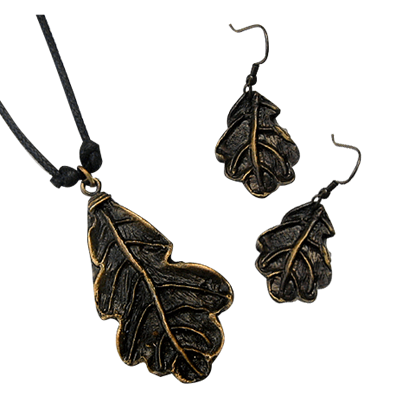 The Antique Brass Leaf Jewelry Set allows you to celebrate this sign of the season with the matching necklace and dangle earrings. 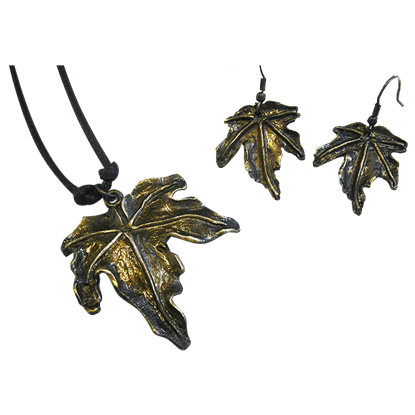 In some mythos, the oak is a symbol of strength and endurance, and this Antique Brass Oak Leaf Necklace and Earring Set echoes that notion, recreating the oak leaf in a bold color that features a dark yet appealing metallic finish. A touch of nature is sometimes all you need in your attire to make it into something great. Luckily, that little touch is easy to add. 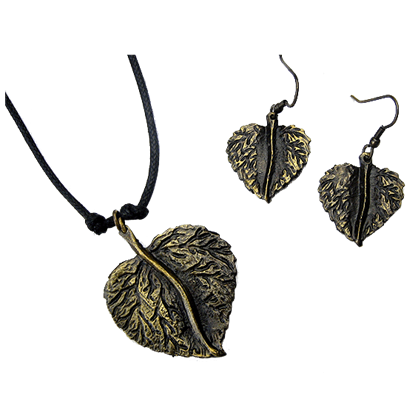 All you have to do is wear part of this Antique Brass Round Leaf Necklace and Earring Set! Jewelry is the perfect way to make any everyday look special. 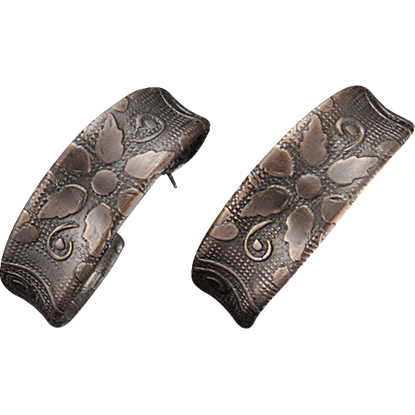 With finely handcrafted details like those featured on the Antique Copper Floral Hoop Earrings, you will know that you are wearing an exceptional and eye catching accessory. The changing hues of leaves serve as one of the loveliest markers of the arrival of autumn. The Antique Copper Leaf Jewelry Set allows you to celebrate this sign of the season with the matching necklace and dangle earrings. It is not hard to enjoy the beauty of nature. 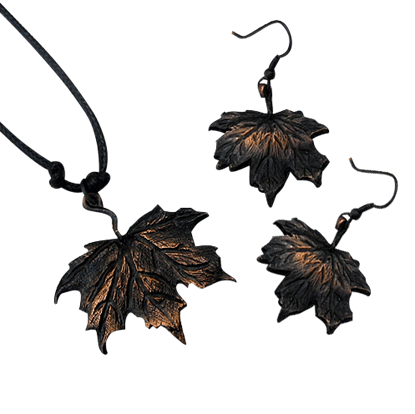 Anyone can take a walk and admire the world around them, just as anyone can easily pick up this Antique Copper Maple Leaf Necklace and Earring Set to add some nature to their wardrobe. A touch of nature is sometimes all you need in your attire to make it into something great. Luckily, that little touch is easy to add. 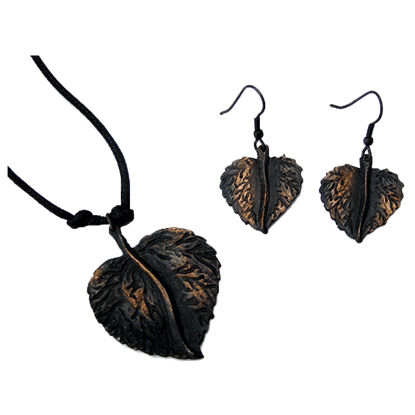 All you have to do is wear part of this Antique Copper Round Leaf Necklace and Earring Set! A touch of gleaming silver is a great way to make your favorite look even better. 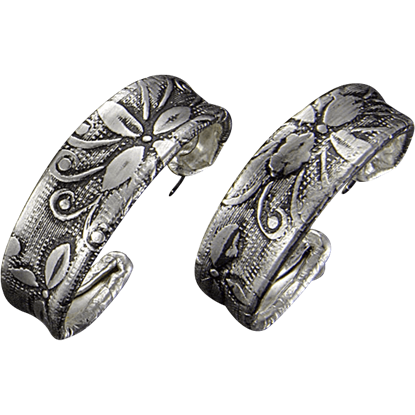 Crafted completely by hand, these Antique Silver Floral Hoop Earrings are the artisanal accent you need to finish off your outfit in a unique way. The changing hues of leaves serve as one of the loveliest markers of the arrival of autumn. 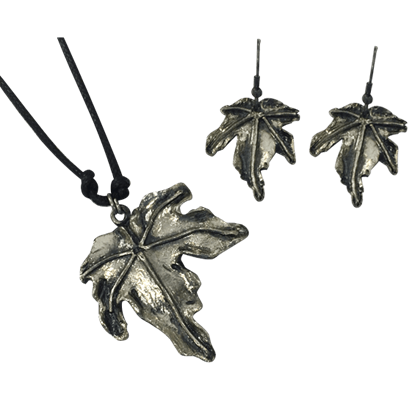 The Antique Silver Leaf Jewelry Set allows you to celebrate this sign of the season with the matching necklace and dangle earrings. It is not hard to enjoy the beauty of nature. 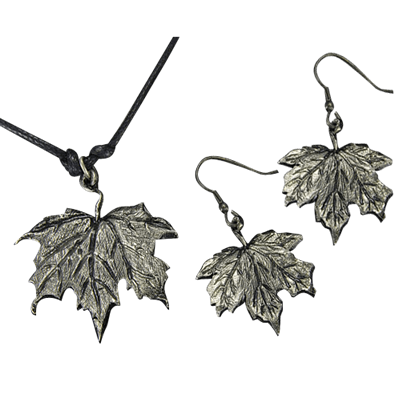 Anyone can take a walk and admire the world around them, just as anyone can easily pick up this Antique Silver Maple Leaf Necklace and Earring Set to add some nature to their wardrobe. 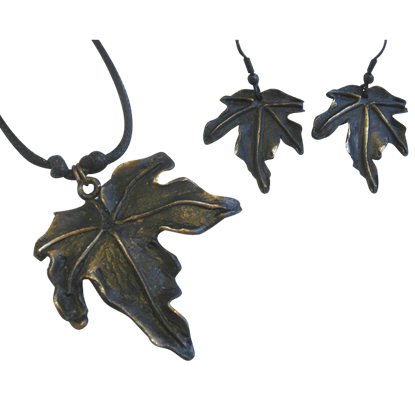 In some mythos, the oak is a symbol of strength and endurance, and this Antique Silver Oak Leaf Necklace and Earring Set echoes that notion, recreating the oak leaf in a bold color that features a dark yet appealing metallic finish. A touch of nature is sometimes all you need in your attire to make it into something great. Luckily, that little touch is easy to add. 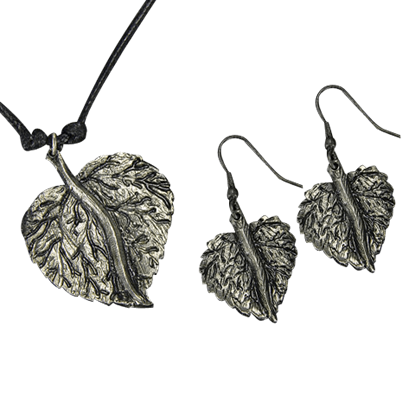 All you have to do is wear part of this Antique Silver Round Leaf Necklace and Earring Set!